Operational Risk (OR) is the risk of direct and indirect loss resulting from inadequate or failed internal processes, people and systems or from external events. This definition includes legal risk but excludes reputational and strategic risks. The basic indicator approach under which capital is calculated as the average over the past three years of a fixed percentage, or alpha, equal to 15% times the enterprise – level positive gross income. Negative gross incomes incurred during this period are excluded from the calculation of the average. The Standardized approach where fixed percentages, called betas, of 12%, 15%, or 18% depending on the business line, are applied to that line’s gross income, positive or negative. The sum across business lines is floored at zero. The average of this result over the previous three years is the capital charge. There is an alternative to the Standardized Approach called the Alternative Standardized Approach that is available to entities that demonstrate that the use of this measure produces a better and improved risk charge. Under this alternative approach, the operational risk capital charge/methodology is the same as for the Standardized Approach except for two business lines — retail banking and commercial banking. For these business lines, loans and advances — multiplied by a fixed factor ‘m’ — replaces gross income as the exposure indicator. Business environment and internal control systems factors. Within the operational risk management framework we will start our discussion with reviewing the three core components and then take a deeper look. Risk control self assessments are used to identify risks present in the various units that make up the entity and the efficiency of the controls used to mitigate them. Using RCSA helps the entity to understand its business processes of its various units (RCSA entities) and their related risks (RCSA risk types & exposure categories), define where the controls are (RCSA controls) and generate a subjective assessment of how well the controls are working (RCSA self assessment). See Annex 3 to understand the methodology followed for a RCSA process. On the basis of this assessment Key Risk Indicators are specified. 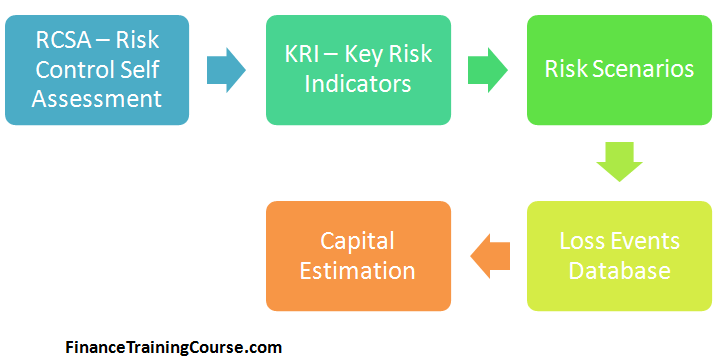 KRIs are measurable metrics or indicators that track operational risk exposure or loss. An example of a KRI is the number of customer complaints. As the customer complaints increase, the probability that there are some underlying and potentially systemic mistakes and errors of judgment being made is likely to rise. Changes in the value of the indicator are likely to be associated with changes in operational risk exposure or operational loss exposure. Other examples of KRIs include volume, staff turnover, frequency of unmatched trades, etc. 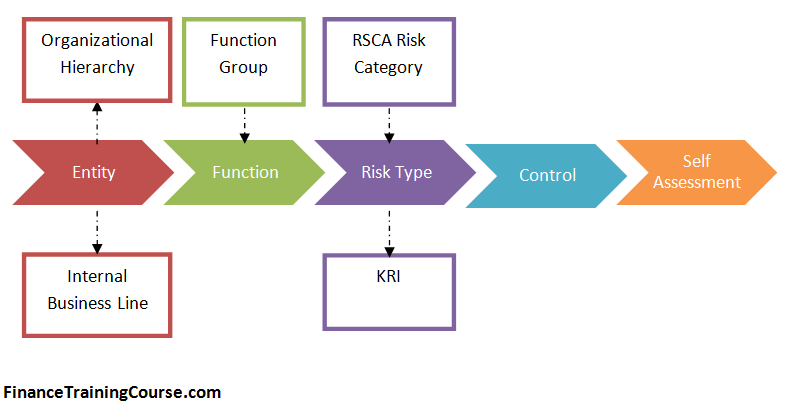 KRI and associated loss events need to be captured with associated organization hierarchy data so that operational risk losses can be assigned to a given function within a given business line. Currently Basel II specifies eight business lines (Annex 8 of http://bis.org/publ/bcbs128.pdf ). According to Basel II (Annex 9 of http://bis.org/publ/bcbs128.pdf), loss events fall into one of seven categories. These categories are further divided by sub category and activities. Near Misses: Operational risk events that do not lead to a loss. Opportunity costs/lost revenues: operational risk events that prevent undetermined future business from being conducted (eg unbudgeted staff costs, forgone revenue and project costs related to improving processes).